Vernon Willard Hughes was Sterling Professor of Physics Emeritus at Yale University (1954-2003). Other institutional affiliations included the University of Pennsylvania and Columbia University. His research interests included muonium and quantum electrodynamics. May 28, 1921Birth, Kankakee (Ill.). 1941Obtained AB, Columbia University, New York (N.Y.). 1942Obtained MS, California Institute of Technology, Pasadena (Calif.). 1942 – 1946Researcher, Radiation Laboratory, Massachusetts Institute of Technology (MIT). 1949 – 1952Lecturer in Physics, Columbia University, New York (N.Y.). 1950Obtained PhD in Physics, Columbia University, New York (N.Y.). 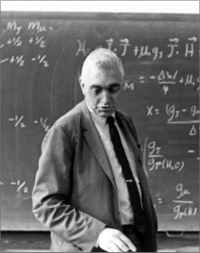 1952 – 1954Assistant Professor of Physics, University of Pennsylvania. 1954 – 2003Assistant Professor to Professor of Physics (1954-1969); Chair, Department of Physics (1961-1969); Donner Professor (1969-1978); Sterling Professor of Physics (1978-1991); and Sterling Professor of Physics Emeritus (1991-2003), Yale University, New Haven (Conn.). 1967Member, National Academy of Sciences. 1968 – 1974Member, Naval Research Advisory Committee, United States Navy. 1970 – 1974Member, Council, American Physical Society. 1978Awarded Davisson-Germer Prize in Atomic or Surface Physics, American Physical Society. 1978 – 1979Guggenheim Fellow and Visiting Professor, Stanford Linear Accelerator Center (SLAC). 1984Visiting I. I. Rabi Professor, Columbia University. 1990Awarded Tom W. Bonner Prize in Nuclear Physics, American Physical Society. March 25, 2003Death, New Haven (Conn.). Wife, married in 1950. Died in 1979. Advisor to Hughes while Research Scientist at MIT. Advised by Hughes at Yale University. Advised by Hughes at Yale University, "Precise measurement of the positive muon anomalous magnetic moment." PhD advisor at Columbia University, "The Radiofrequency Spectrum of (RUBIDIUM-85-LABELED) Rubidium-Fluoride and (RUBIDIUM-87-LABELED)-RUBIDIUM Fluoride by the Electric Resonance Method,” and both employed at Columbia University. Advised by Hughes at Yale University, "Experimental limits for the electron-proton charge difference and for the neutron charge." Both employed at Columbia University and Yale University. Obtained AB (1941) and PhD in Physics (1950). Lecturer in Physics and Visiting I. I. Rabi Professor. Guggenheim Fellow and Visiting Professor. Member, Council and received 1978 Davisson-Germer Prize in Atomic or Surface Physics and 1990 Tom W. Bonner Prize in Nuclear Physics. A Festschrift in honor of Vernon W. Hughes : Yale University, 13 April 1991 / edited by Michael E. Zeller. Atomic and electron physics. Edited by Vernon W. Hughes and Howard L. Schultz. Facets of physics / Edited by D. Allan Bromley and Vernon W. Hughes. The Gregory Breit Centennial Symposium : Yale University, USA / editors, Vernon W. Hughes, Francesco Iachello, Dimitri Kusnezov. The meson factories / Torleif E.O. Ericson, Vernon W. Hughes, and Darragh E. Nagle. Vernon Willard Hughes Physics Today obituary.